We stopped at Barnes & Noble as I read about the atrocities occurring in Charlottesville and my faith in humanity was restored. People are not inherently bad, as some may say. Every person in that Barnes & Noble store was treated with decency and respect. The clerk kindly provided new plastic bags to the homeless lady who had just washed her clothes in the bathroom sink next to me. Regardless of our unique current life circumstances, each customer was treated with kindness and dignity. The soccer mom with 5 kids, the elderly gentleman, the homeless ladies, and myself were all treated in the same manner. I happily checked out with my new Moleskine and we headed to REI. To our surprise, REI was having its damages sale. Not to our surprise, everyone seemed to be doing back to school shopping. It was a perfect storm of people and chaos. I could not find preferable socks or the glow-in-the-dark Nalgene I've been wanting since Banff. We left. 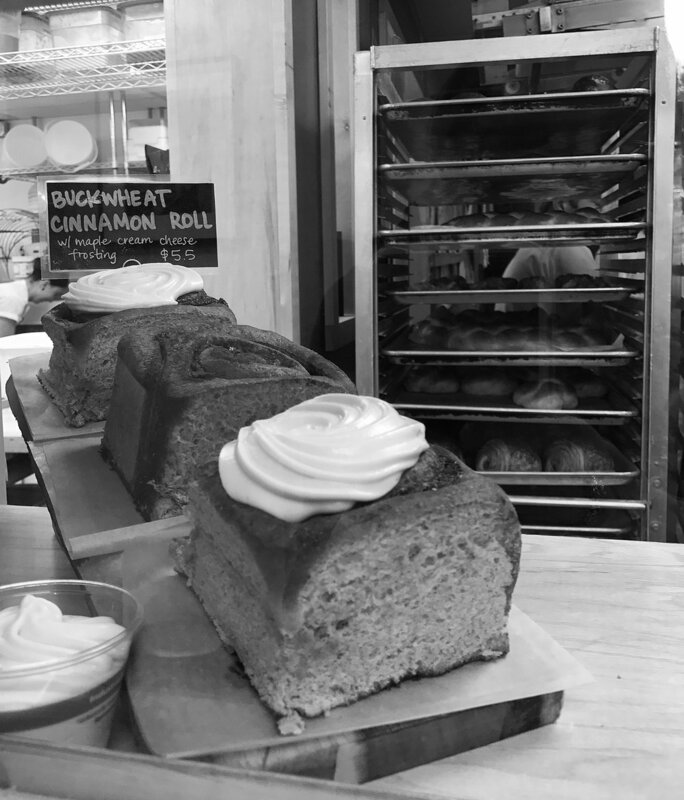 We headed over to Fire Island Rustic Bake Shop. Who knew that so much happiness could happen in one place? The gleefully handed us warm chocolate chip cookies (I still prefer yours, SK) for being first timers! How cool is that? They even have fried. chicken. scones. Yes, fried chicken scones. Indicator #1 that I wasn't feeling good, because we didn't get one. What the hell was I thinking not to get one?!?! (Jinks had made us delicious scones fresh for breakfast that morning though.) We did get a salted caramel tart that we saved for later, and a freshly baked granola bar. After Fire Island, we headed over to the Saturday market where we saw many of the same vendors from Friday Flings. There were only two vendors of fresh produce. Almost all others targeted tourists with their craftwork, whether it be clothing, jewelry, knives, or these interestingly carved antlers. I began drizzling rain and we headed for our next stop on the agenda: Wild Scoops Ice Cream. Wild Scoops uses local ingredients and flavors, well as much as possible I'm assuming, because I haven't seen a coconut tree here in Alaska. But I'm not going to complain, because the had the BEST dairy-free ice cream that I've ever tasted. It tasted just like the real deal, but I know it wasn't, because... well, you don't want me to get into that. I had the Birch Bliss that was a coconut ice cream with a birch syrup swirl. I'm disappointed that I won't be in Anchorage again to get more. After Wild Scoops, Mom wanted to wander through the tourist shops of mass produced useless things like t-shirts, cups, lanyards, etc. Happy with my ice cream, I obliged and wandered with her before I couldn't take it anymore and requested we head to our next stop. After the bubbles and a walk back to the parking garage, we headed for our bed and breakfast.